Convert your Windows™ PC into a multimedia web server ! Enigma TV SERVER is an interface working on a Windows™ PC that enable to stream your GigaBlue, Dreambox, Vu+, ITgate, Amiko (or any Enigma 1 & 2 STB) over the Internet. - New Windows Phone app 1.0 ! : control Enigma-TV from your Windows Phone. With Audio track choice and EPG / EPG Next. - New : load IPTV channels (M3U) in Enigma-TV Server. - Displays 'PICON' images in channels list (Server and Client applications) ! - KODI add-on 2.0.0 ! 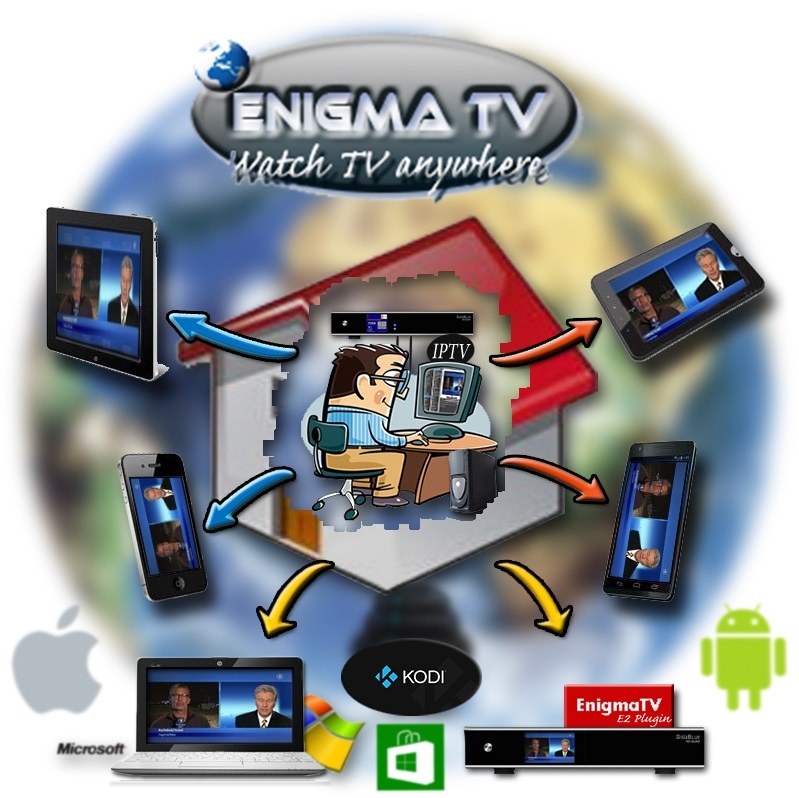 : control Enigma-TV from KODI Media player. - Android app 2.2 ! : control Enigma-TV from your Android phone / tablet. With Audio track choice and EPG / EPG Next. - iOS app 2.1 ! : control Enigma-TV from your iPhone / iPad / iPad Mini. With Audio track choice and EPG / EPG Next. - Windows app 2.0.0.4 ! : control Enigma-TV from another PC with Windows OS. With Audio track choice and EPG / EPG Next. - E2 plugin ! : control Enigma-TV from another Set To Box (by Toysoft). - Video stream compression : you will be able to watch TV on any place in the world, on any device (like on a smartphone with 3G data speed). - Automatically detect Enigma 1 or Enigma 2 Set Top Box (Dreambox, Vu+, Etc ...). - Watch any media due to the included multimedia player. - Built-in web interface that you can open on any devices over the Internet (Iphone, Ipad, Android phone, Android Tablet, Mac, PC). - Direct or programmed records on your STB HDD, on your computer HDD or any network place. - Multilanguage (any new language can be added). - Mini-TV function : only show a sizable video screen without interface and always on top of any other windows.